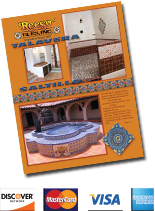 12" & 8"-Saltillo Octagon-Natural-Sealed - Reeso Tiles, Inc.
-- None -- 12" 8"
Properly boxed and packaged Saltillo 12" or 8" octagon semi gloss sealed natual clay tile. Sold per piece. The 12" is one piece per sq. ft and the 8" is 2.3 pieces per sq. ft.
Octagon & dot = one 12" octagon & one 4" sq. or one 8" octagon & one 2" sq.